Well another tag to show you. This one is not too difficult to make and a little different than distressing. On this tag I used some nice scrap paper and just cut the same size like the shipping tags. 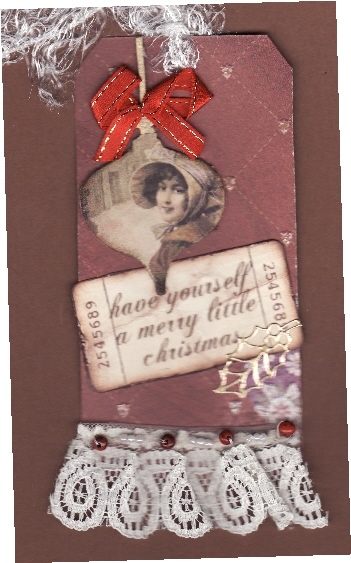 The ornament is a grungeboard cut out from a Tim Holtz collection and I covered it with this nice vintage lady. If you click on the image you will notice the colouring of her, I didn't touch it up at all. I painted the stem on the ornie with a touch of gold acryllic paint and added a ribbon from my stash. I then printed off a Miss Cutie Pie free holiday ticket sheet I downloaded last year and ran my scissors along the edge of the ticket to distress the paper a bit, ran my Java inkpad over it. Before I added the lace to the bottom I just quickly hand stitched the little red beads on. Thanks to my Mum I am using up all kinds of lace these days. I added a bit of fiber at the top but it is too white here so must find some off white which will only improve the vintage feel. Funny how you see things a bit differently on the screen after they are complete. Thanks again for stopping by. I hope you enjoy my own version of Christmas tags. I know a lot of us don't have the fancy dies and things Tim Holtz uses so why not do your own bit of creativity. Oh and a bit of good news for me.......I have found out I won some blog candy again over at InkStains with Roni. A while back she posted some bamboo tiles and if you left a comment you had the chance to win something and I found out yesterday I won. Wow for someone who doesn't win much I have won a couple things online now. So never say never and keep posting comments, you never know you may win something, even here!!!! Stay tuned for Tag #5. If I keep trying maybe I will be lucky! what do you think? I love them all. Keep up the good work sweetheart. I love you. Very vintage! Love the ticket accent. Nice work...thanks for continuing to do this, I know time is at a premium this time of year! Love the vintage tag beautiful paper. Looking at you work of art Lesley you encourage me to keep making tags.